Steve Wigley is set to become assistant to Stuart Pearce at Nottingham Forest after leaving his role as Fulham Under-18s boss, BBC Radio Nottingham reports. 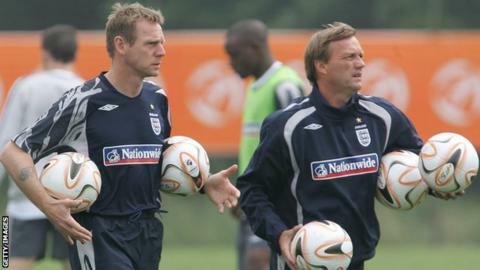 Wigley, a former Forest player and coach, worked with Pearce at Manchester City and England Under-21s. The 52-year-old had been with Fulham since 2012 and led their Under-18s to the FA Youth Cup final last week. "It's very disappointing that Steve has left. He was a great asset to Fulham," said academy director Huw Jennings. "But he has received an offer in football that he felt compelled to accept and impossible for us to persuade him otherwise. "We wish Steve all the very best and thank him for his contribution during his time here." Wigley played 82 for Forest between 1981 and 1985, before spells with Sheffield United, Birmingham, Portsmouth and Exeter. His first job in management came with Aldershot, but he returned to the City Ground as assistant academy director under Paul Hart, before moving up to become first-team coach.